Three years ago, I became obsessed with tonkotsu ramen, a Japanese dish of noodles in a pork bone based broth. Tonkotsu broth is made by boiling pork bones (sometimes in combination with chicken) until the soup has rich and hearty pork flavour (see my recipe here). The broth should be milky and practically opaque in colour. Some people find tonkotsu broth too heavy, but that’s what I love about it. Ramen noodles come in various thicknesses and some restaurants will let you specify your desired texture (i.e. al dente or soft). 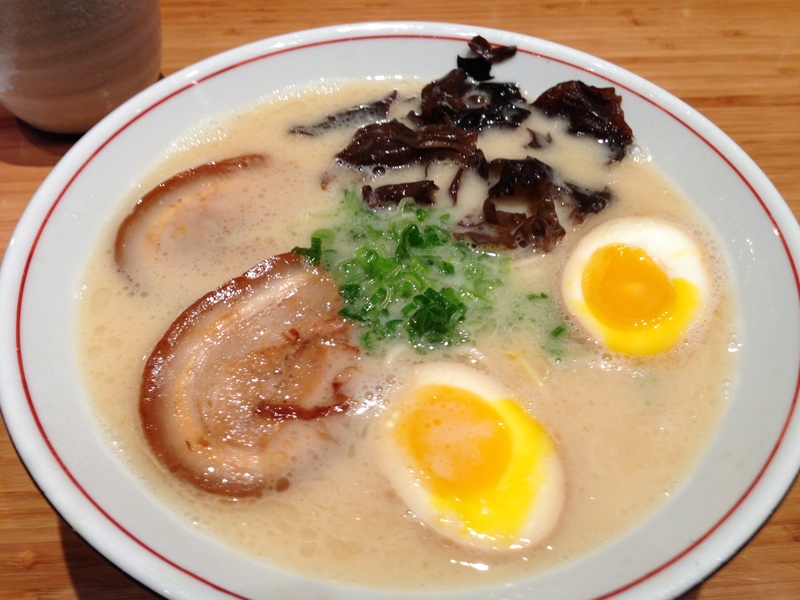 Ramen toppings differ depending on where you go. My favorite toppings are soft boiled marinated eggs and thinly sliced pork jowl. At the time that I first discovered ramen, the only ramen you could find in Toronto, ON was MSG laden and closer in resemblance to instant noodles than the real thing. So when I had the opportunity to travel to New York City and San Francisco, USA, I went in search of the best ramen they had to offer. I’ve only shared my review of my favourite ramen place in NYC, because I didn’t like any of the ramen places that I tried in San Francisco. San Francisco supposedly has some of the best and most authentic ramen in North America, so it’s possible that I simply failed to choose the right places. 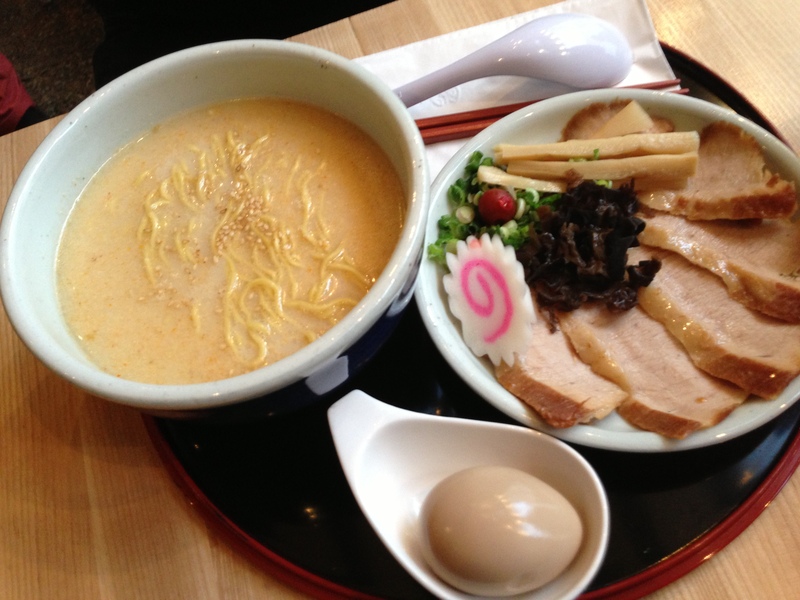 Luckily, over the past year, we’ve seen an explosion of new ramen places in downtown Toronto. So, naturally, I ate my way through all of the promising ones. I ate so much ramen in such a short period of time, that I haven’t eaten it since I completed my ramen tour. But that just means that the next food obsession may begin. 😉 Keep your eyes open for my Donut Tour of Toronto. Why couldn’t I be obsessed with something healthy??? In my opinion, Ippudo has the best ramen in NYC. I felt that their tonkotsu broth had a great balance of real pork flavour with that great taste you can only get using MSG. If you go to Ippudo, be sure to try their hirata buns, because they’re even better than the ramen! The pork buns are better than the chicken. The shrimp hirata buns are the best but are not actually featured on the menu, so ask the waiter about them. 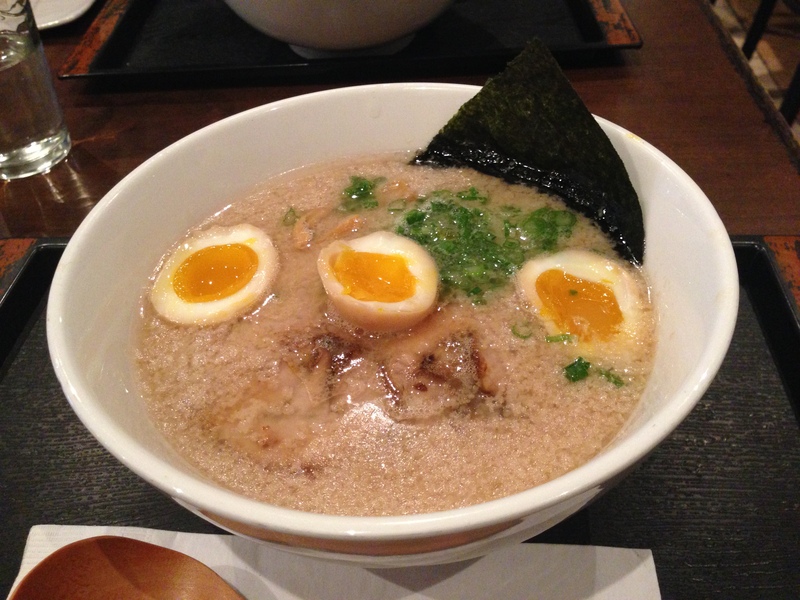 Here are my brief reviews of all of the ramen places in Toronto, ON that I’ve tried. These are based only on my personal opinions and experiences. I have not listed them in any particular order as I wanted to be able to point out the strengths and weaknesses of each place. Please note that I have focused mainly on the tonkotsu broth, because that’s what matters most to me. In fact, I’m not the biggest fan of ramen noodles, because a lot of them have a strong alkaline flavour. Looking back, I realize now that I should have paid more attention to the differences in texture for the purpose of these reviews. Ramen Isschin is one of the newer ramen places in Toronto. I really like the simple decor which consists of a long painted wall amidst natural elements like wood and stone. The customer service was welcoming, nice, attentive, and competent. I am very glad that I tried it, because they make my new favourite tonkotsu broth. They claim to boil their pork bones for at least 18 hours. I believe them, because you can really taste the rich, hearty, and natural pork flavour. I ordered the ‘rich’ ramen and the tonkotsu broth was wonderfully thick and heavy with a lot of pork fat floating on the surface. I also love their broth the most because I taste less MSG in comparison to the other restaurants. In terms of toppings, their soft boiled eggs were cooked perfectly. However, I was disappointed that they don’t have pork jowl and their cha su was too tough and bland for my taste. Also, their noodles are too alkaline for me, but it doesn’t seem to bother most people. Next time I will try the white sesame ramen, also tonkotsu broth based, because you can actually grind your own sesame seeds. The chicken karage, although small in portion size, was nice and crispy on the outside and moist on the inside. This was one of the first ramen chains to hit Toronto. I would say that of all of the ramen places I’ve tried, they are the least authentic, because most of their broth and topping options are actually from Chinese cuisine. Although I do prefer Chinese over Japanese flavourings, I’m more of a traditionalist when it comes to food, so I prefer my ramen to be as authentic as possible. Also, the Ajisen Ramen broths are too heavy on MSG and sodium for me. Kenzo currently has 2 locations in Toronto. Although the tonkotsu broth at Kenzo is too high in MSG and sodium for me, I must say that, hands down, they have the best toppings. 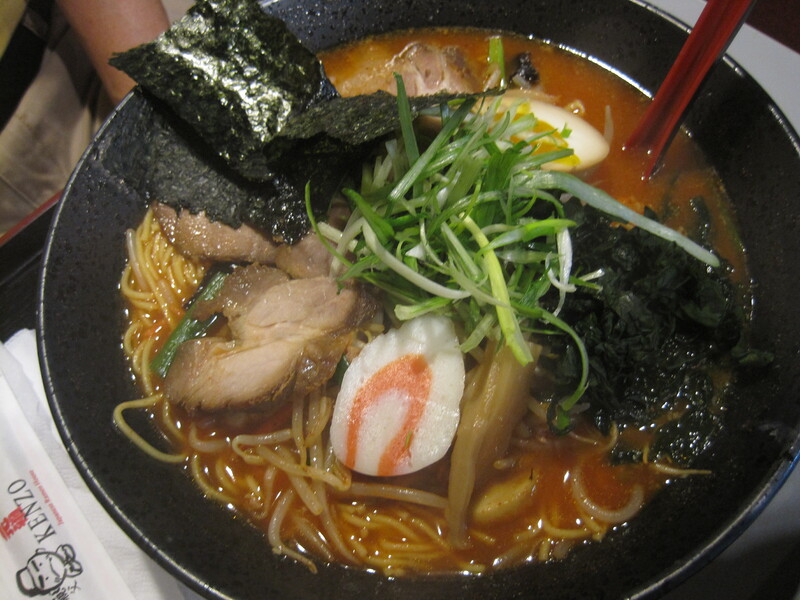 Their King of Kings Ramen (photo shown below) is particularly loaded with toppings. I thought that their fatty pork slices and soft boiled marinated eggs had the best flavour (mainly salty) of all of the places that I tried. Also, I thought that their pickled bamboo shoots added great texture and cut the saltiness of the broth very nicely. Furthermore, I liked that they placed a small mound of finely minced garlic on the side of the bowl for you to mix in with the hot noodles and soup. However, regardless of how much I liked the toppings, the sodium, caloric, and carbohydrate intake is only worth it to me if the broth is rich, hearty, and full of real pork flavour. Santouka is a very popular international chain. The one in Toronto is its second Canadian location (the first one is in Vancouver). I went twice and had to wait in line both times, but was disappointed with the food. In my opinion, the tonkotsu broth was too salty and too thin for my taste. I prefer a heavier broth and theirs just didn’t have a strong enough pork flavour. Also, I didn’t enjoy their toppings (mainly because I don’t like black fungus and they went too heavy on green onions). Note that you have to pay extra for marinated eggs. 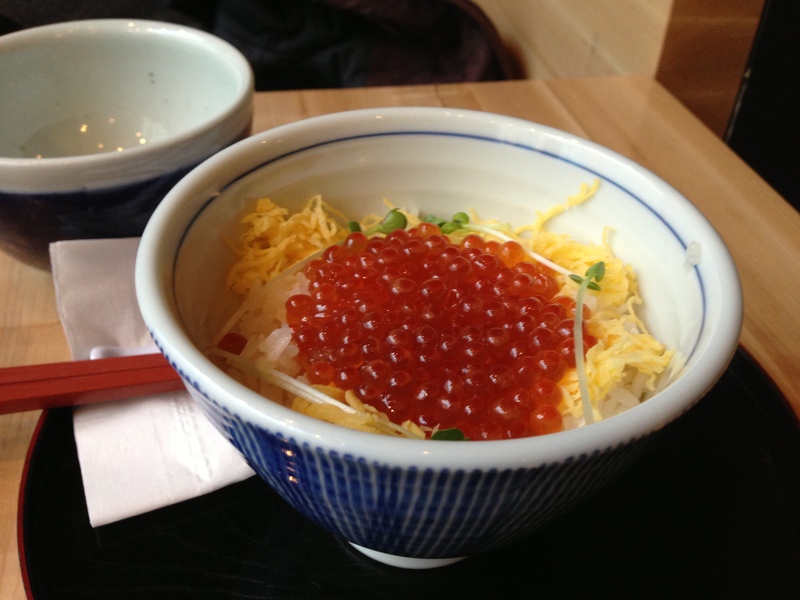 I would like to add, however, that their salmon roe rice bowl wasn’t bad (photo shown below). Sansotei is among the top 3 of my favourite ramen places in Toronto. I love that you have a choice of original, thin, or thick ramen noodles. I prefer the thin ones. I liked that their tonkotsu ramen came with soft boiled marinated eggs, however I didn’t like the black fungus and I thought they used too many green onions. Their pork slices were good though. I thought that their broth had much better pork flavour than the broth at Santouka’s and I liked the noodles at Sansotei more as well. 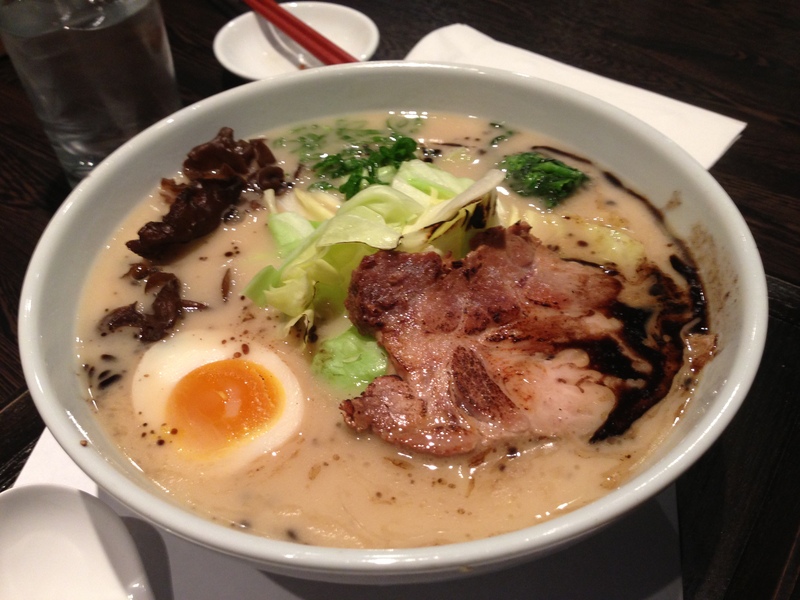 What I loved about Raijin’s tonkotsu broth is that it tasted the most home-cooked to me. In fact, it tasted very similar (but obviously better) than the tonkotsu broth that I made from scratch (see recipe here). I couldn’t taste MSG in their broth and I loved that I could taste rich, hearty, and real, pork bone flavour. I also really liked the black garlic oil that they used. I suspect that most people look for, or are simply just used to, a more “flavourful” broth than Raijin’s. I have to admit that although I appreciate the healthier, no-short-cuts-taken option, I too prefer the taste of a broth that has a little bit of MSG in it. I would like to point out that the ramen noodles served at Raijin seemed to be particularly strong in alkaline flavour, which I did not enjoy. So, although I appreciate Raijin’s tonkotsu broth the most, and although it currently sits among my top 3 favourites, I will always choose Sansotei or Ryoji over Raijin. 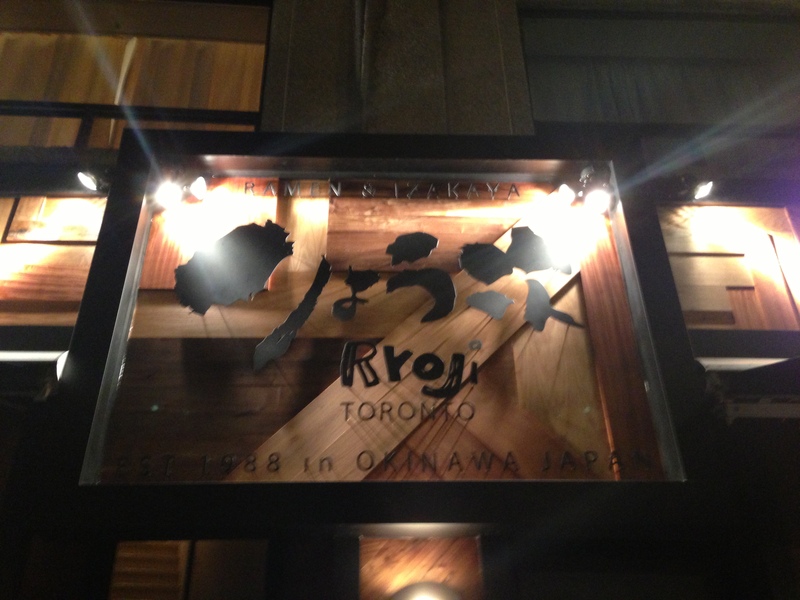 This is among my top 3 favourite ramen places in Toronto. It has the nicest decor, in my opinion. However, the ventilation system in the open kitchen didn’t seem to be strong enough, because the dining areas became uncomfortably smoky and warm, so we didn’t stay long. But I definitely liked the tonkotsu broth and noodles enough to go back. 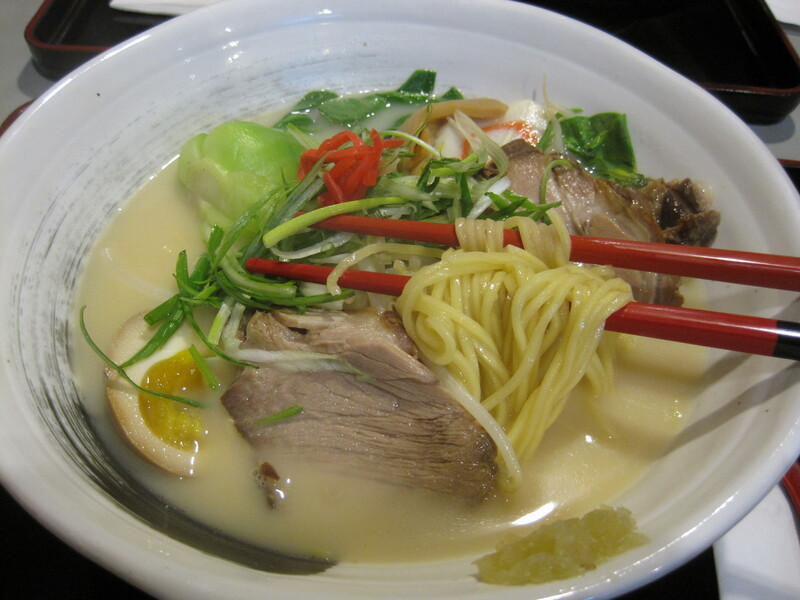 I thought that the tonkotsu broth had a great balance of rich pork flavour with the use of added MSG. I liked the toppings, but note that you have to pay extra for a soft boiled marinated egg. I would like to start off by saying that I hated the meal that I had at Momofuku daisho in Toronto. We had the large format meal (see menu here) and it was the most overpriced, overrated, and poorly designed meal that I have ever experienced. The creators of the dishes did a horrible job of fusion cuisine. They executed the Asian components poorly and then paired them with seemingly random components from other cuisines that either didn’t work flavour wise or made the dish difficult to eat. For example, they used bone-in deep fried chicken (which was dry and not even crispy, by the way) and served it as a wrap. The pieces of chicken were too big and too thick for the wrap and it was impossible to eat it as a wrap given that there were large and sometimes, oddly shaped pieces of bone in the meat. Epic Fail. Anyways, a friend of mine convinced me to try the Momofuku noodle bar. 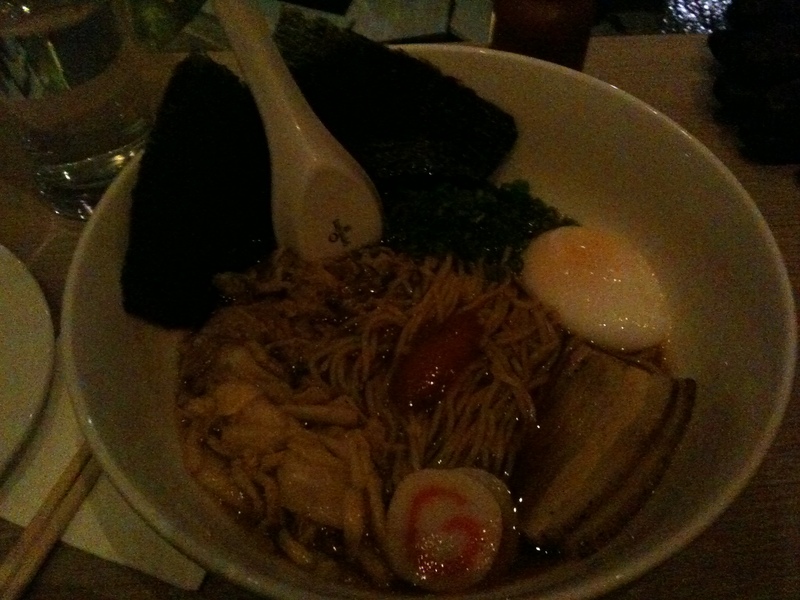 I ordered the Momofuku ramen and although the stock tasted of high quality to me, it was too bland. I liked the pickled ginger, a lot, but it wasn’t enough to make up for the dry and tasteless pork shoulder and belly. The poached egg was cooked perfectly, but I would have preferred the authentic Japanese soft boiled and marinated egg. Also, the noodles did not have enough bounce or chewiness for me, although I appreciated the lack of lye flavour. I didn’t even finish my noodles. This may have been the first time that I didn’t finish a bowl of ramen. My friend ordered the same thing and he wasn’t impressed with the ramen either. I will say that the spicy lamb buns weren’t bad, but they were very overpriced. 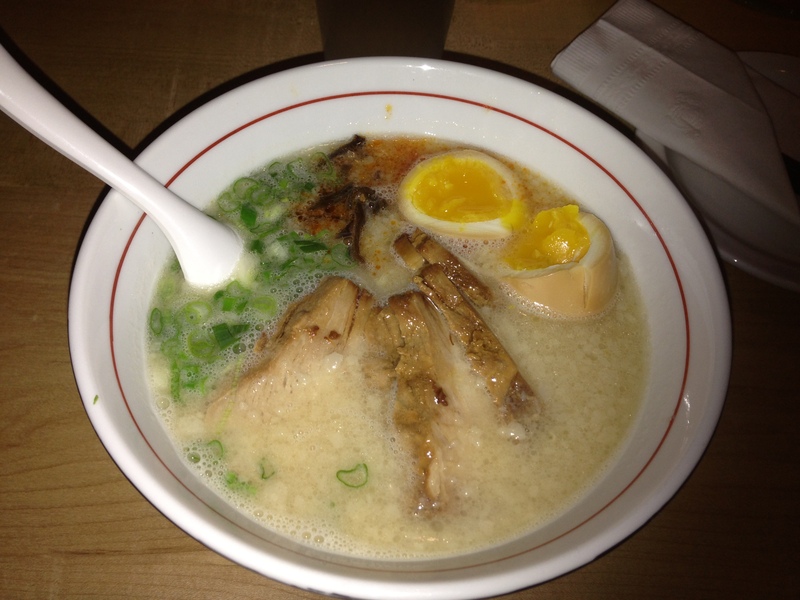 I am listing Kinton as a try-worthy ramen place in Toronto, because it has received a lot of attention and some very good reviews. However, despite its popularity, I have chosen not to try Kinton for myself, because it was started by the owners of Guu. I celebrated my birthday at Guu a couple of years ago and my night was ruined by the atrociously bad host and highly overrated, mediocre food. We tried most of the items on their menu and it felt like they used the same three sauces over and over again. So, if you’re on a mission to find your favourite ramen place in Toronto, you might want to put Kinton on your list of places to try. If you do, please let me know what you think. Maybe, just maybe, I’ll give it a chance if a lot of you love it. Update: Even more reason not to go: Kinton Ramen received yellow cards two weeks in a row from food safety inspection November 2014 (see here). Ha, we are the two halves to make up one ramen-loving fiend! While I do think the broth matters, I’m way pickier about the noodles. : ) I’ve been to Ajisen in Toronto, but none of the other places, although I have been to the Santouka in Vancouver. (Love their noodles; very nice balance of toothiness, egginess, and lye.) I thought their tonkotsu broth was quite good (and definitely better than the miso broth my mom chose) but I don’t know that I’ve tried an “amazing” broth to measure it against. We had to pay extra for the egg, but oh, so worth it. The texture was perfect!